ARTbaby's mission is to assist childless couples to achieve their goals of building a family through surrogacy and egg donation. We firmly believe that surrogacy and egg donation is the last & only hope available to the childless intended parents after several failed IVF cycles or as indicated the last resort by the treating IVF specialist. With our several years of expertise, we can assure that the intended parents have a great experience throughout the surrogacy & IVF donor cycle. We also assure for full honesty, confidentiality, and transparency throughout the process and thereafter. ARTbaby Surrogacy & Egg donation Centre focuses on reducing the anxiety that is normally an indispensable part of the IVF treatment. Our commitment is to providing the highest quality treatment through our experienced & qualified IVF specialists and paramedical staff. Ravi Sharma is a self-motivated young entrepreneur. He is Bachelor in Pharmacy with MBA in Marketing. 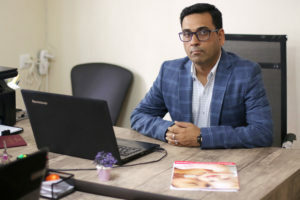 He has written various articles on Surrogacy and Egg donation based up his practical experience touching the life of surrogates mothers, egg donors, and the Indented Parents. He has dedicated his life to the sufferings of the childless couples and individuals. He is never tired of assisting people, surrogates and egg donors and made his available for them 24X7. He is working in the segment of Infertility treatment for 8 years. He is associated with the successful launch of Medical Tourism Company offers assistance in various infertility treatment options. ARTbaby offers traveling egg donor program and surrogacy options to the clients worldwide. He is a true professional with a great human touch and feels. With his dream & commitment towards creating families for all, he has the clear focus on providing products, services & knowledge in the fertility field. She is young, caring and good at hospitality. She had 3 years experience as a Patient Coordinator. She speaks English & Georgian. The founder and director of the Georgian-American Center for Reproductive Medicine –ReproART, work in this field for over 20 years. Member of the National Committee of the European Society of Human Reproduction In-Vitro fertilization clinics in the United States. 2006-2012 Head of In-Vitro fertilization section at the Junona Medical Center, Tbilisi, (extension of the URA center, New Jersey, USA). 2003 – 2006 Senior embryologists at the In-Vitro fertilization department of the Zhordania Institute for Human Reproduction. 2000 – 2003 Embryologists, head of the laboratory at the Junona Medical Center, Tbilisi. 1997 – 2000 Embryologists at TheFertility and Reproductive Medicine, New York, USA. 1996 – 1997 Research coordinator, leading the Molecular Biology department at the Mount Sinai Medical Center, New York, USA. 1995 – 1996 Embryologists, Reproductive Health, Annandale Medical Centre, Virginia, USA. 1994 – 1995 Research assistant at the Jone’s Institute for Reproductive Health, Norfolk, Virginia, USA. 1983 – 1994 Researcher at the Zhordania Institute for Human Reproduction where the first child in Georgia using the Intra Cytoplasmic Sperm Injection (ICSI) was born. She is the President of the Association for Reproductive Medicine and Biology of Georgia. and Embryology (ESHRE). Dr. Chkonia holds Doctorate from Jone’s Reproduction Institute, the city of Norfolk, USA. (where the first child in the United States was conceived with the use of the in vitro insemination method). Certified teacher of Assisted Reproductive Technology, in particular, micromanipulation training programs at the Jone’s Reproduction Institute. American embryologist Dr. David H. Mcculloh, Ph.D. H.C.L.D., C.C. He Holds Ph.D. from the University of Maryland and Research Associate Professor. Department of Obstetrics and Gynecology, NYU Langone Medical Center. Dr. Mccullohis an Associate Professor at Dept. OB/GYN and Women’s Health, New Jersey Medical School, UMDNY, and he is also the director of Endocrinology laboratory at Biogenetics Corporation, New Jersy, USA. Dr. Mcculloh plays an important role as the staff member of the School of Medicine in New Jersey and at the University of Health Sciences, Oregon, Portland. He has worked in the field of in vitro fertilization since 1983 and is the author of many scientific papers, books, and monographs. Dr. Nino (Ph.D.) is a clinical embryologist working more than 5 years in Embryology and Anthology. She is a research scientist with more than 15 years of experience specializing in biomedical research, who has contributions in critical areas of Biology such as Immunology, Molecular Biology, Human and Animal Physiology, and Molecular Genetics. 1998-2003 – Graduate student, got Ph.D. The research was conducted at the Department of Psychiatry, NYU Langone Medical Center, New York, NY, USA, and Human and Animal Physiology, I. Beritashvili Institute of Physiology, Tbilisi, Georgia. 1996-1998 – Graduate student, got B.S. with honors from Pushchino State University Department of Physiology and Biophysics, Pushchino, Russia. 1986-1991 – Graduate student, got B.S. with honors from Tbilisi State University, Department of Biology, Tbilisi, Georgia.